I had been anticipating Eddie McStiff’s like a teenage boy downloading Lindsay Lohan pictures with a dial-up modem. I was excited, but a little nervous. What if the place is packed? What if I can’t get in? What if all those hipster mountain bikers and Jeepers who crowd into Moab every weekend give me the “velvet rope” treatment at the front door? What then? 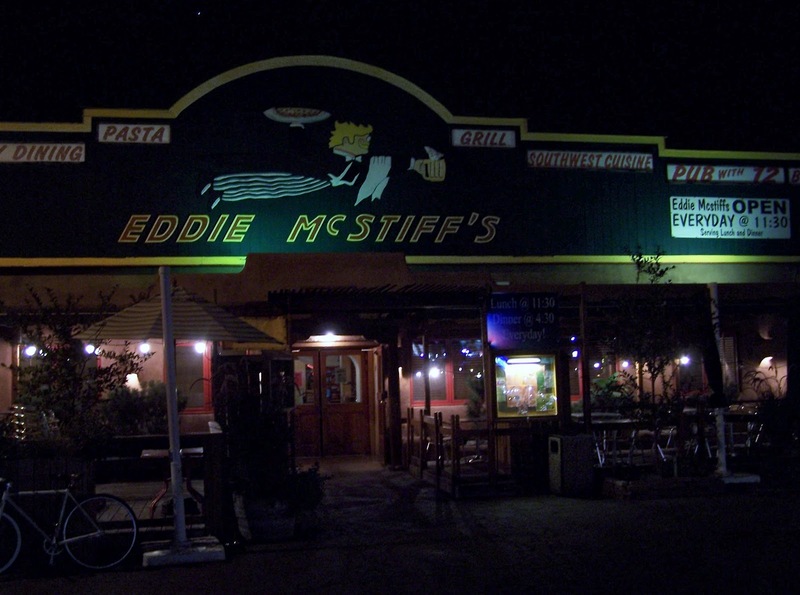 I can’t come all the way to Moab and not treat my loyal Suits in Strange Places readers to a review of the world famous Eddie McStiff’s! You have to understand, this normally isn’t a problem. Thanks to my Suit757 schedule, I typically pull into places like this around 10:30 on a Tuesday night hoping to beat last call. It was Friday night at peak dinner hour during peak season. At 7pm I impatiently checked into what was literally the last available hotel room in town. This town was booked solid! I better get to Eddie McStiff’s and start standing in line now! Moab is the Mecca for play hard/party hard scruffy-faced outdoorsy types who come from all over the world to go off road, kick up some red dirt and leave fat tire marks on the slick rock of Eastern Utah. 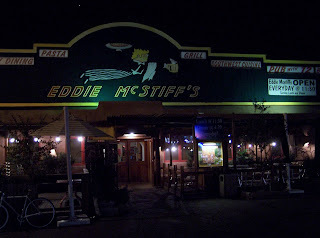 And when they’re done ripping up the red rock landscape they all pile into Eddie McStiff’s to eat, drink and party. Kind of an oasis of fun in this buttoned up Mormon state. The place was as quiet as the Mormon Tabernacle on Mardi Gras. All that anticipation. For this??? 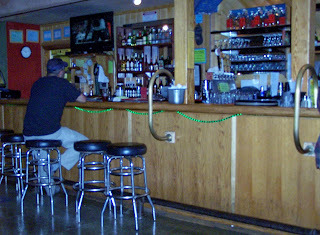 One lonely guy on a bar stool. A couple smokers out on the patio. And Suit757. Whoo-hoo! Friday night in Moab! Unfortunately, the food didn’t do much to elevate the somber atmosphere. 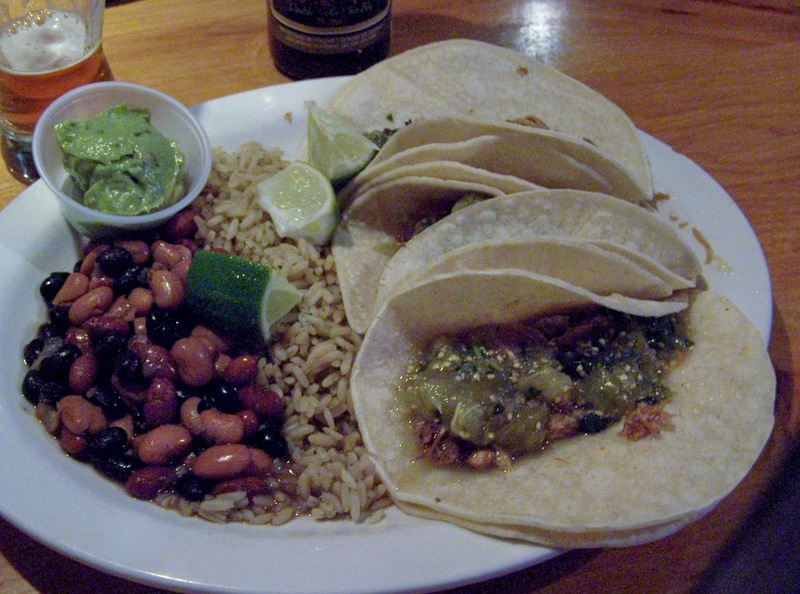 My pork tacos were a bit skimpy for $13. A little green chili salsa and a side of forgettable rice and beans, I considered this entre to be more of an appetizer. There’s no way this would satisfy any dirt-covered mountain biker building up an appetite zipping up and down the canyons of Moab. 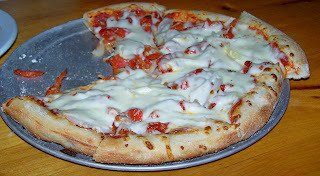 I moved on from my tacos and proceeded to eat half of a pepperoni and sun dried tomato pizza. Much better. 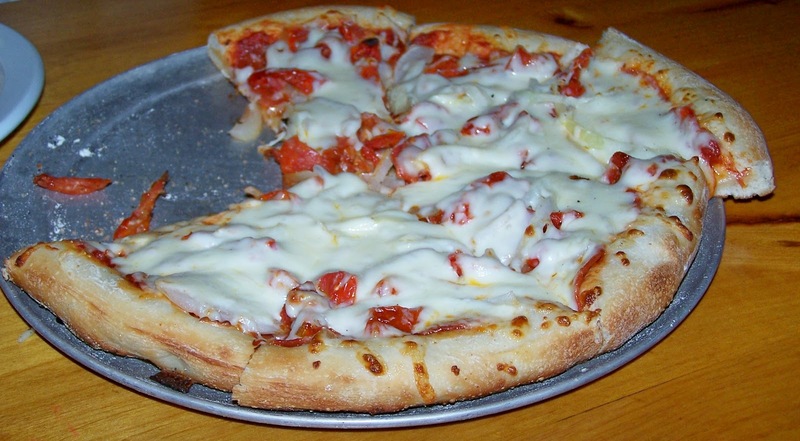 Certainly nothing fancy or gourmet about it, but at least this pizza was generous with the cheese and toppings. 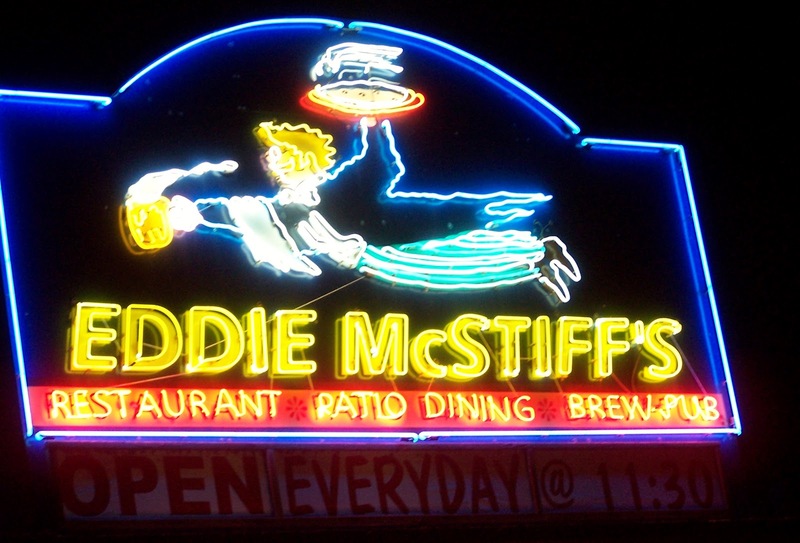 Part of Eddie McStiff’s party hearty reputation comes from the fact that it retains one of Utah’s few coveted “Club” liquor licenses. Basically, that means you can actually get a real beer here. As long as you get it in a bottle. My waitress tried to explain it to me. She said there are ten different types of liquor licenses in Utah. Only a few places in the state have been able to bribe the right politicians to sell bottled beer over 4% alcohol. 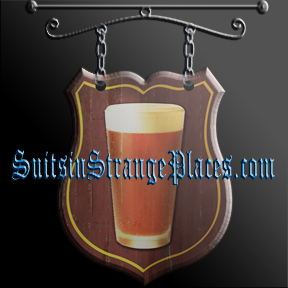 And no place in Utah – not even the famous Utah microbreweries themselves – is allowed to serve draft beer over 3.2% alcohol. That’s a full 1.5% lower than those watered down mass produced American light beers. You’ve got to love those “free market” Utah Republicans. Out to save us from the evils of Bud Light. As you might imagine, this creates a bit of tension between the Mormons who make up 60% of the population – and 80% of the politicians – and the free-spirited fun-seekers who flock to the mountains, canyons, slick rocks and white water of Moab. 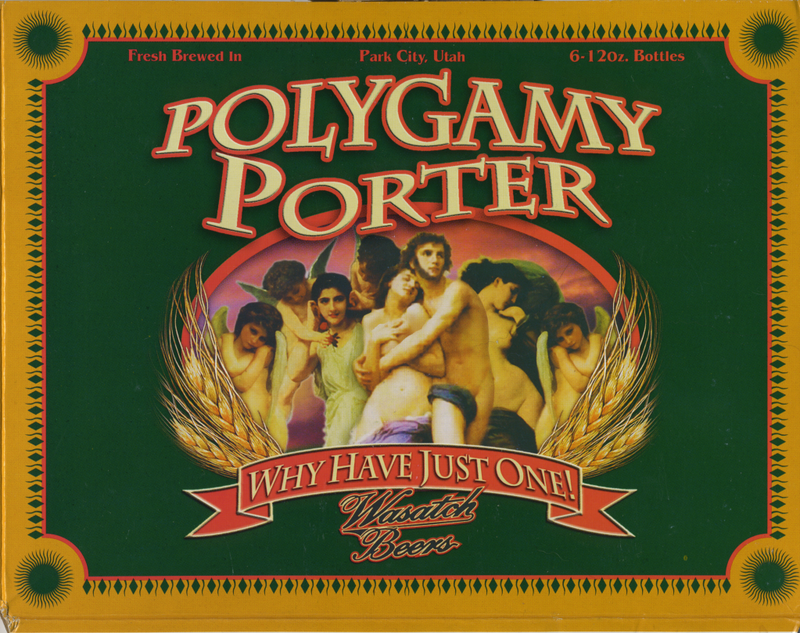 A tension that became obvious as soon as I perused Eddie McStiff’s list of Utah beers. 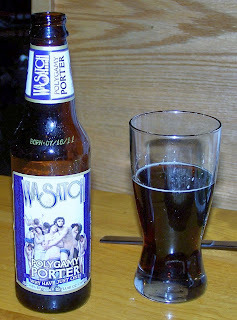 Of course I couldn’t resist the urge to order a Wasatch “Polygamy Porter”. 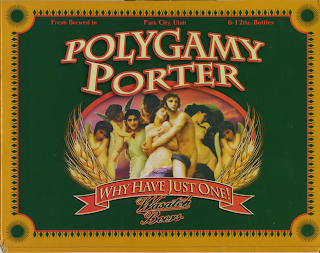 Never mind that Mormons supposedly gave up on polygamy over a century ago. The Utah brew masters who try to make a living by navigating the state’s corrupt labyrinth of alcohol laws and licenses seem to relish any opportunity for payback. Well, as it turns out that’s a pretty easy question to answer. Because it’s just not that good. I needed something with a bit more kick than 4% ABV. 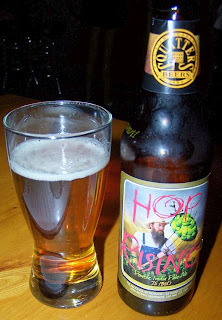 So I upgraded to a bottle of Squatters Hop Rising, a double IPA. Nine percent alcohol. Hoppy and strong, this Utah brew makes whatever Eddie McStiff’s owner had to do to get permission to sell it all worthwhile. Too bad there was no one else in the place to share in my Suit757 frivolity. 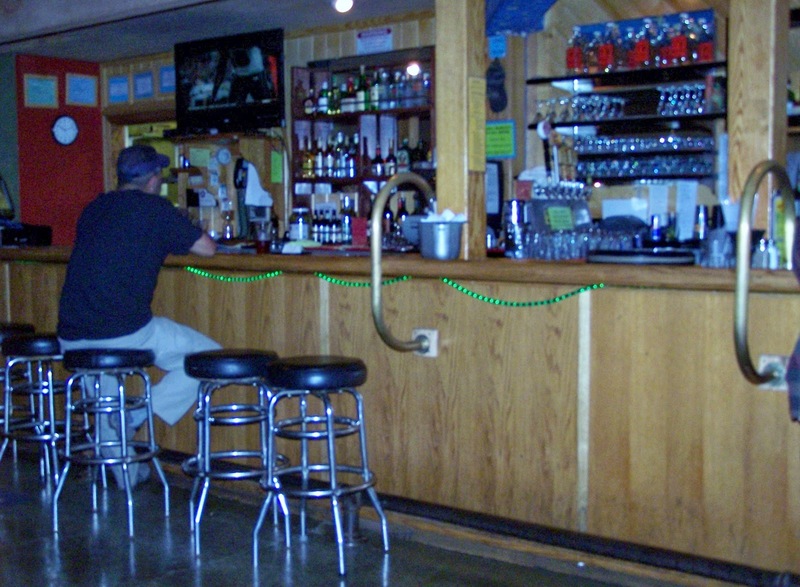 By 10pm on this Friday night, my waitress had begun sweeping the floors and putting the chairs up on the tables. So much for wild parting in Moab. So much for worries about velvet ropes. So much for my anticipation of downing beers with that guy from the movie who cut his arm off with a pocket knife. A nice new IPA for me to try. Thanks. you show up at the end of February in a desert summer activity town and expect it to be hopping with parties ?